Aatifa is a former student at Queensborough Community center, where she studied visual art, and is now a professional traditional African dancer who performs and teaches music dance and all of the arts to the youth of New York. Today she is sharing a bit about why and how she cut her hair on New Years Eve, insecurities and utlimately, self love.. Growing up I never had the choice to use any type of chemicals in my hair or skin. My mother and my grandparents raised me to appreciate the kinks and the curls that were growing from my head and also to appreciate the culture of my African roots. They taught me the harm that perms and relaxers and certain products would have on my body. + Tell me a little more about your hair story, how was it as a child, teenager, young adult, and now? As a child growing up I only had braids, beads, shells, afro puffs, and twists. These were styles that I grew in love with and I loved them until I was 10. It was around that time that my mother decided to lock our hair, to pay homage to my ancestors of Jamaica. Once they were in, I was called Medusa, mop head, and all of the worst names you could think about. 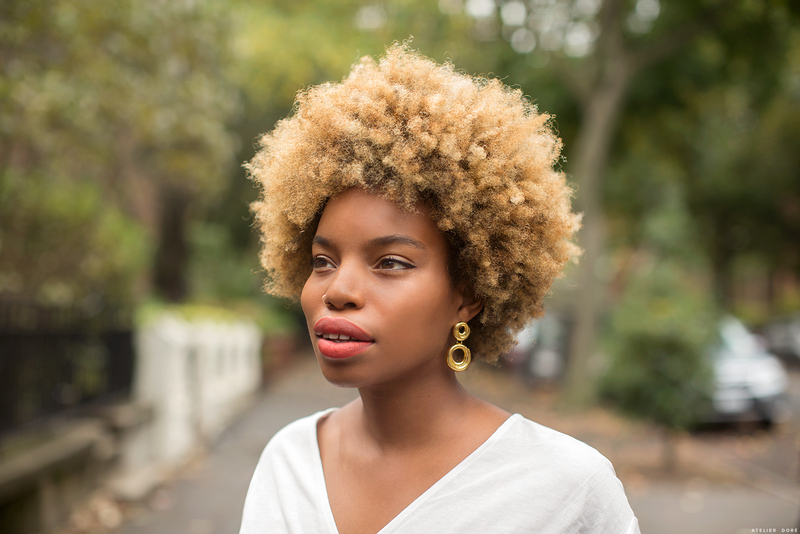 After a while, I cut my locs off and ended up with my kinks and then started to use a hot comb to straighten my kinks and curls–which didn’t last long because it was as powerful as a perm–so I was back to braids. After the hot comb, my mother decided to cornrows and hairstyles that accented my forehead, and other features I was already insecure about. I was teased throughout the ages of 11 until I was in high school. + What was the process of you cutting off your hair? How would you describe it? It was New Years Eve in 2015, and a couple of hours before the ball dropped, I took out my the weave and noticed the damage. Sometimes I struggle with embracing all of me and my features, and now I look back at photos of me growing up and saw myself and realize that I didn’t look too bad. I was so hard on myself then, and still can be. Cutting my hair for the first time was like being stripped of my clothes. Somehow, being naked, hairless, and make-upless, made me realize I couldn’t hide. I was afraid but I felt some sort of strength within myself and freedom. + Why did you choose to shoot in the Metropolitan Museum? The last time I was here, I was in Elementary school and the Egyptian Temple is a place that I felt I needed to revisit. When I was younger, I remember feeling like I was I belonged and was so proud to know that a piece of my ancestral roots was in this great piece of art. I wanted to feel and execute that throughout the shoot. I wanted to feel my roots and show my roots and be the Egyptian Queen through my pictures and carry out my confidence while standing around such a strong powerful and bold artifact. When you’re surrounded by art, you are allowed to be free, and not judged. You can be outgoing and expressive. Black hair is of all those things. Our roots are expressive. From them nappy and wild, down to us weaving and braiding a design. +What has been the most moving experience of being natural? It was the day I cut my hair. It was New Year’s Eve and I got dolled up to visit my family, and on my way to walk to the building we had to pass a group of black men who were just hanging out in front. As we passed I feared that I would be made fun of or even questioned if I was a woman or man (I don’t know why! haha), as we walked by them, we wished each other a happy new year. It quickly turned into multiple compliments. I walked away in tears because of their uplifting words. They didn’t even know I had such strong insecurities within my mind and soul, and just cut my hair off a few hours earlier. I feel most comfortable when… I am with my friend Desmond. He’s been so sweet to me and always points out that I am beautiful without make up without the comfort of a wig and loving my shortcuts. He understands the beauty of all black women and appreciates our features. Beautiful and moving story, just as Aatifa! Thank you for sharing. Stunning, Aatifa! I agree, thank you for sharing your hair journey.